How can I identify an image inside of a larger image? I have two pictures. One is a small image of Waldo and the other is a much larger image with him hiding somewhere. My goal is to create a program that will find Waldo using only the functions length, size, imread, and image. This is what I have so far. What I am doing here is taking the first pixel of the Waldo image and seeing where the R G B values of that pixel occur in the wheresWaldo image. I found several instances and stores them in the variables ivals and jvals. ivals represent rows and jvals represents columns. 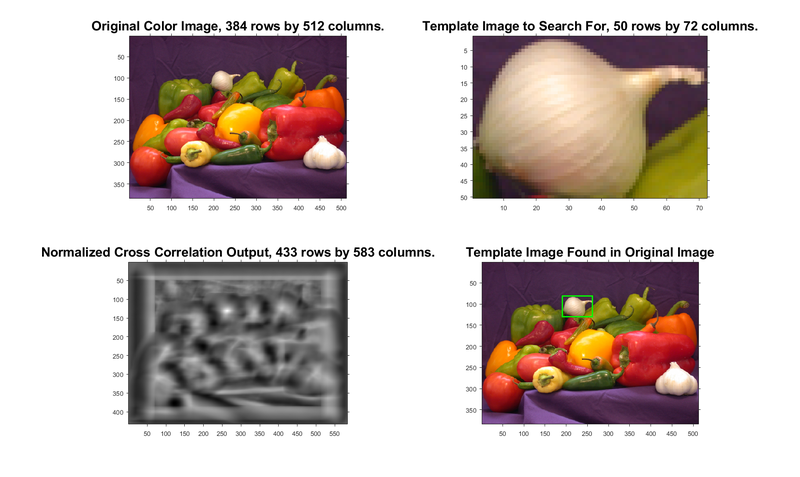 You can use normalized cross correlation with normxcorr2(), or you can use isequal() (if the small image and large image match exactly pixel for pixel). See attached demo. Hi. Please take a look at my post again. I cannot use either of those functions. I listed the functions that I am allowed to use. I need to take advantage of for loops and if statements. You will need the outer loops to scan your little image over the larger image. Then, at each location, you'll need another pair of loops to compare every pixel (all 3 colors) of the small image to the large image. So you're missing a pair of for loops.